﻿ Howie Hayman - Music - Korean Popular Music (Kpop). K-pop (an abbreviation of Korean pop; Korean: 가요 kayo) is a musical genre originating in South Korea that is characterized by a wide variety of audiovisual elements. Although it comprises all genres of "popular music" within South Korea, the term is more often used in a narrower sense to describe a modern form of South Korean pop music covering mostly dance-pop, pop ballad, electronic, rock, hip-hop, R&B, etc. In 1992, modern K-pop was ushered in with the formation of Seo Taiji & Boys, whose successful experimentation with different music styles had sparked a paradigm shift in the music industry of South Korea. As a result, the integration of foreign musical elements has now become a common practice in the K-pop industry. By tapping into social networking services and the video sharing platform YouTube, the K-pop industry's ability to secure a sizable overseas audience has facilitated a noticeable rise in the global proliferation of the genre. Since the mid-2000s, the K-pop music market has experienced double digit growth rates. In the first half of 2012, it grossed nearly US$3.4 billion, and was recognized by Time magazine as "South Korea's Greatest Export". First gaining popularity in East Asia in the late 1990s, K-pop entered the Japanese music market towards the turn of the 21st century. In the late 2000s, it grew from a musical genre into a subculture among teenagers and young adults of East and Southeast Asia. Currently, the spread of K-pop to other regions of the world, via the Korean wave, is seen in parts of Latin America, Northeast India, North Africa, the Middle East, Eastern Europe and immigrant enclaves of the Western world. 2NE1 (Korean: 투애니원; pronounced To Anyone or Twenty One) is a four-member South Korean girl group formed by YG Entertainment in 2009. 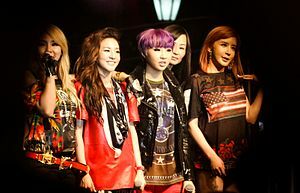 The band consists of CL, Minzy, Dara, and Bom. The name 2NE1 combines the phrases "21st century" and "new evolution" (NE). Girls' Generation is a South Korean girl group formed by S. M. Entertainment in 2007. The nine member group consists of Taeyeon, Jessica, Sunny, Tiffany, Hyoyeon, Yuri, Sooyoung, Yoona and Seohyun. The group gained attention at the beginning of their career with songs such as "Into the New World" and "Kissing You" but it was not until 2009 when they gained significant popularity with their hit single "Gee", which would be named as South Korea's "Song of the Decade". From left to right: Taeyeon, Hyoyeon, Seohyun, Sooyoung, Yoona, Jessica, Tiffany, Sunny and Yuri. Kara (Hangul: 카라, Japanese: カラ, often stylized as KARA) is a South Korean pop girl group formed by DSP Media in 2007. The group is composed of Park Gyuri, Han Seungyeon, Nicole Jung, Goo Hara, and Kang Jiyoung. The group's name comes from the Greek word "chara" (χαρά, lit. "joy"), which they interpreted to mean "sweet melody". Park Jae-sang (born December 31, 1977), better known by his stage name Psy (Korean: 싸이, IPA: [s͈ai]; English: /ˈsaɪ/ SY), stylized PSY, is a South Korean singer, songwriter, rapper, dancer, and record producer. Psy is known domestically for his humorous videos and stage performances, and internationally for his hit single "Gangnam Style." 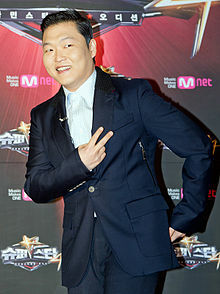 The song's refrain "Oppan Gangnam Style" (translated as "Big brother is Gangnam style", with Psy referring to himself) was entered into The Yale Book of Quotations as one of the most famous quotes of 2012. On October 23, 2012, Psy met UN Secretary General Ban Ki-moon at the United Nations Headquarters where Ban expressed his desire to work with the singer because of his "unlimited global reach". On December 21, 2012, at around 15:50 UTC, his music video for "Gangnam Style" exceeded 1 billion views on YouTube, becoming the first and currently only video to do so in the website's history. Psy was subsequently recognized by the media as the "King of YouTube". Rainbow (sometimes stylized as RAINBOW; Hangul: 레인보우, Katakana: レインボー) are a 7-member South Korean girl group signed to DSP Media. The members are frontwoman Jae Kyung, Go Woo Ri, Cho Hyun Young, Kim Ji Sook, No Eul, Oh Seung Ah, and Jung Yoon Hye. T-ara (pron. : /tiˈɑːrə/; Korean: 티아라, Japanese: ティアラ, often stylized as T-ARA or T♔ARA) is a South Korean girl group that debuted in 2009 under Core Contents Media. Before their debut, there was a high level of interest in the group; they were called the "Super Rookies" and had been training for three years.